Should your workers be required to pass OSHA 10 and 30 hour training to work for your company? Ideally, yes, so that they protect themselves and they know how to protect the safety of others on job sites. Does OSHA require the 30-hour outreach courses? OSHA does not mandate the 30-hour outreach courses. They do accept and approve courses that fit their standards, however. Keep in mind that certain states do require OSHA 30 hour course completion. Many employers also require it so that all their workers are educated on ways to minimize and reduce job site hazards (1). How long does the OSHA 30 hour certification last? The course completion cards in Construction, General Industry, and Disaster Site do not have an expiration date, but know that it depends on your employer, state, and industry. The student cards provided in the Maritime Outreach Training Program expire five years after the training (7). The bottom line: recommendations and requirements vary by state and by industry, so just because the card doesn’t expire with OSHA doesn’t mean it is still considered valid. Check out this resource to learn more about your specific state (2) and look into specific regulations and requirements your company follows. Does the OSHA 30 hour certification expire? Similar to the last question, the card issued by DOL doesn’t expire (besides the maritime card) per OSHA rules, but most companies have workers take the course at least every 3-5 years. There are also other regulations that need to be taken into consideration that differ based on industry, company, and even by state (3). How long does it take to complete OSHA 30? It does depend on whether you take the course online or in-person. As the name suggests, the course is about 30 hours; if you take the course in person, consider how there will still need to be time for traveling to the training site and normal time for breaks and meals. Generally speaking, be ready for 35 to 45 hours, in total, to complete the training (4) or approximately 4 days. When is OSHA 30 hour training required? Recall that the OSHA created the training as a voluntary program, but certain states have decided to make OSHA 30 and/or OSHA 30 training mandatory for certain types of workers. Also, certain unions or other jurisdictions have also mandated the training (5, 7). Many employers see it as an effective way to have all workers onboarded to occupational safety and health at their organization. What will I (or workers) learn in OSHA 30 hour training? How to involve their co-workers in the behaviors and mindsets above (6). 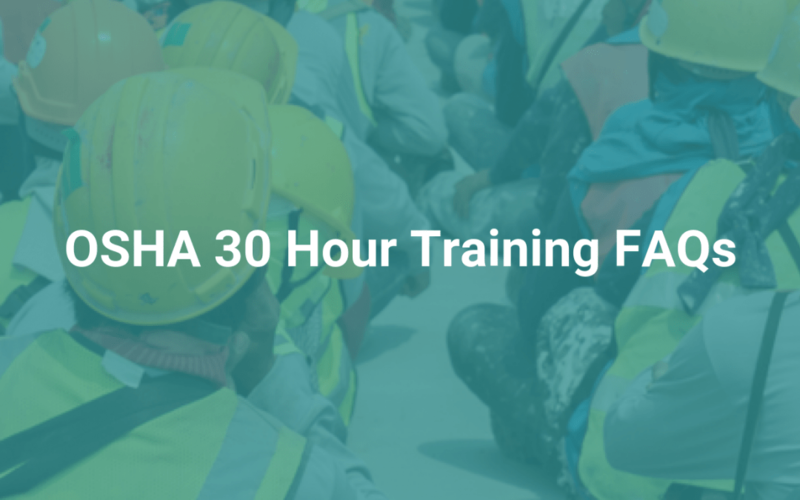 How do I know if I should take a 10-or 30-hour OSHA course? The 10-hour class is focused on awareness of common job-related safety and health hazards. On the other hand, the 30-hour class is more appropriate for supervisors or workers with some safety responsibility because it offers more in-depth content (7). Authorized trainers will offer specific content based on the specific industry being examined. What should I know when selecting a trainer? Be sure you’re attending a course with an OSHA authorized outreach trainer. Trainers are authorized (not certified) through this program to deliver Outreach training classes, but they are not OSHA staff. No matter their approach to teaching, all trainers should possess a trainer card which includes an expiration date along with the name of the authorizing OTI Education Center (7). What are other requirements in terms of course completion? As of right now, OSHA requires that the 30-Hour training course be completed within a 6-month period of when you start, when taken online. You also must hit a minimum score of 70%. Last, you have three chances to pass the test when taken online. What do I receive as proof of completion? Once you satisfy requirements for the 30-hour training, you receive a wallet card as proof that the course has been completed. That shows you attended and successfully completed the entire class, including all requisite topics and the minimum number of contact hours (7). Be sure you educate, train, and equip all your workers, supervisors, and managers on hazard recognition, injury prevention, and critical OSHA safety standards. Learn more and sign up for OSHA 30 hour training today.